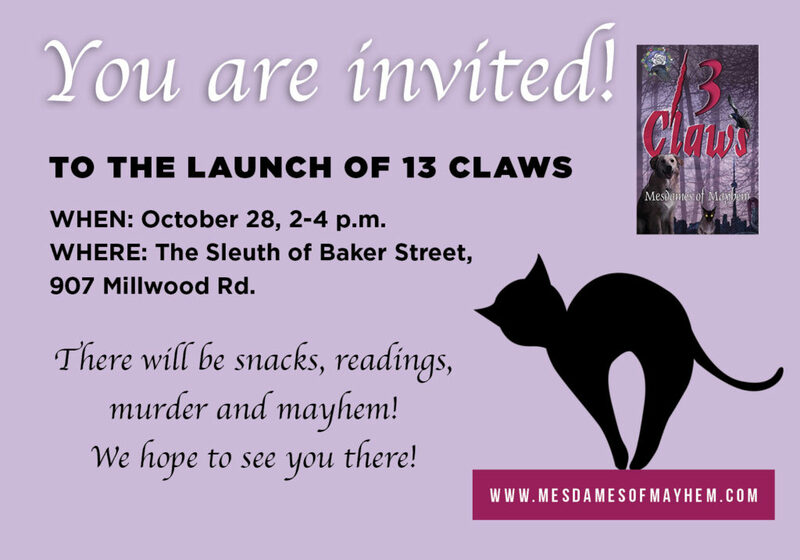 Excited about the launch of the Mesdames of Mayhem’s third anthology, 13 Claws, which I believe is our best collection yet. Many years ago, my friend and fellow author, Jane Burfield had the idea for an anthology that centred on animals: animals as heroes – or villains. In 2016, our publisher, Carrick Publishing, gave us the go-ahead and here we are, better late than never. Jane is a champion of encouraging new writers. 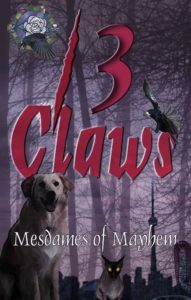 The Mesdames held a contest and three authors new to the crime fiction genre, Mary Patterson, Roz Place and Marilyn Kay, have stories in the book. If you’re in the Toronto area, do join us at the launch. There will food, drink and readings. Come out and support our favorite bookstore, Sleuth of Baker Street. NEW YORK CITY- what’s not to love!! Our visit took a literary bent. 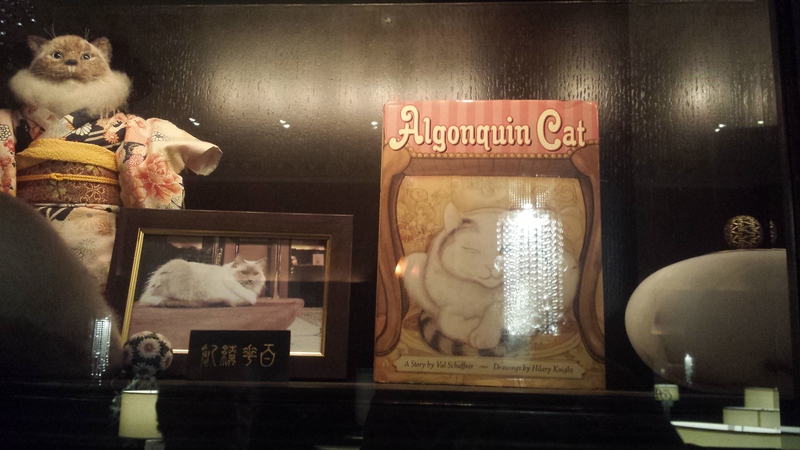 We stayed at the Algonquin Hotel, site of the famed Round Table where sharp-tongued Dorothy Parker and her literary frenemies traded barbs and founded the New Yorker magazine. Every guest room at the hotel gets a free copy. What’s it like to stay there? Great, actually! 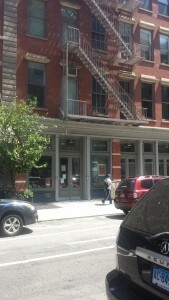 Location is excellent next to Times Square. The rooms are small, like all NYC hotel rooms, but elegant and well-designed. Each door sports a pithy saying from a member of the Round Table. You can download selected best-selling authors for free. 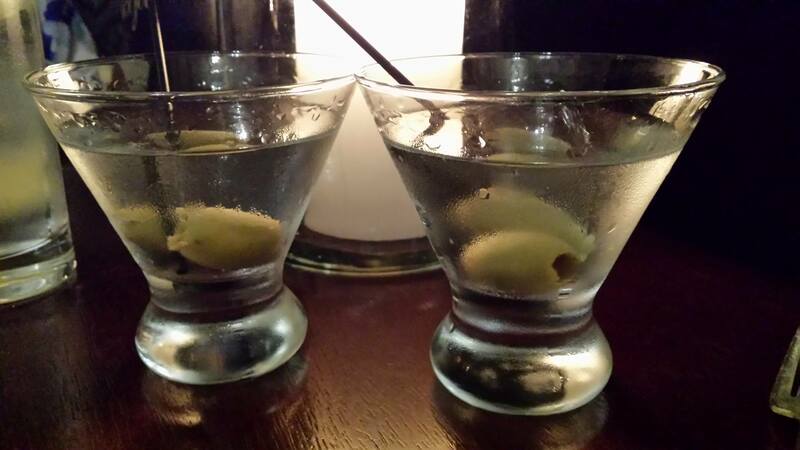 And the bar delivers the – wham! – best martinis in NYC. Economy rules: after one, you’re flying all night! Another neat tradition: the Algonquin boasts a resident cat. Current version, Matilda, happily sleeps in a mahogany file tray on the check-in desk, Do Not Disturb sign prominently displayed. You can book Matilda for your birthday party: her fees go to support a local animal shelter. 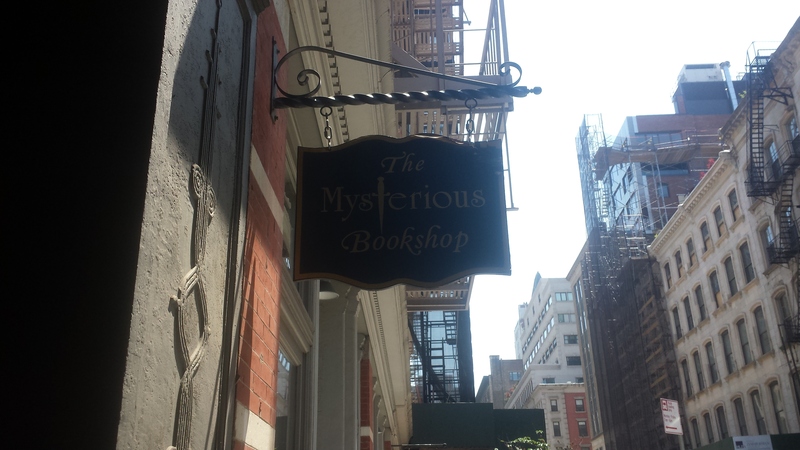 I crossed an item off my bucket list when we checked out The Mysterious Book Shop, NYC’s legendary crime book store. 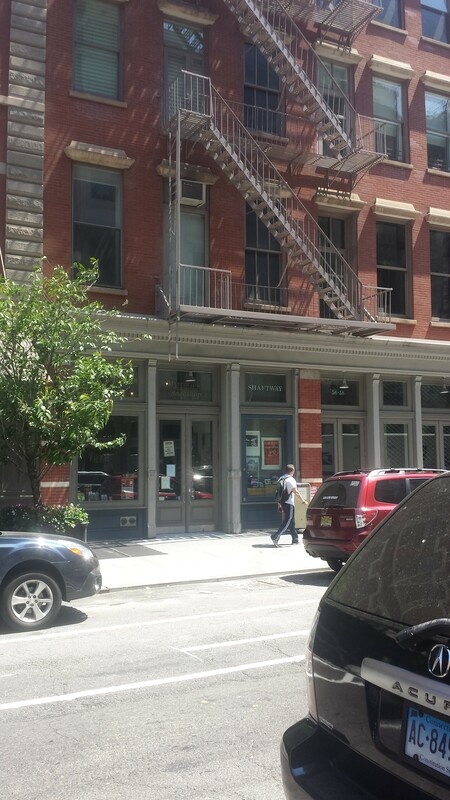 It was founded in 1980 by the equally legendary Otto Penzler who lives upstairs. 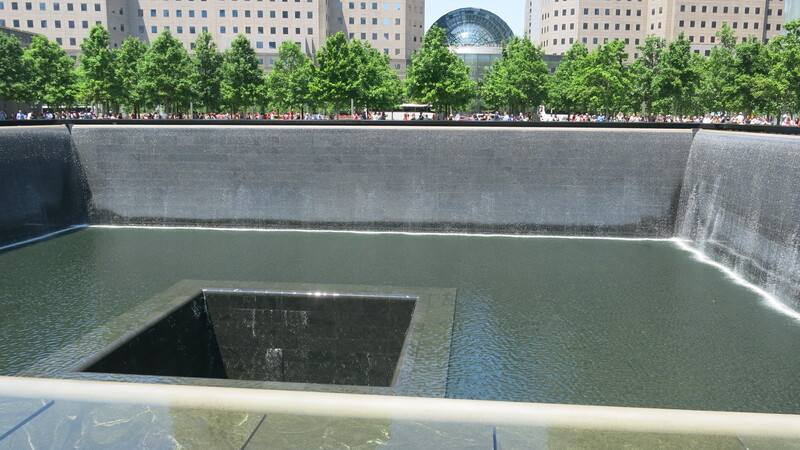 The bookstore is located in the cool Tribeca area of Manhattan at a disturbingly short distance from the former twin towers, now memorialized by two sunken waterfalls with the names of the fallen carved into the stone edges. The Mysterious Book Shop is not much bigger than my favorite Toronto bookstore, Sleuth of Baker Street though it does sport towering book shelves, easily 15 feet high. You really do need that ladder to reach the top four or five shelves! 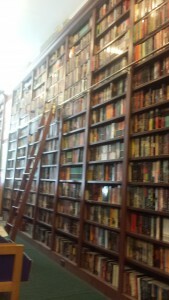 Like many bookstores today, its stock is a mix of new and vintage books. Signings are held several times a month: if you launch your crime book here, you know you’ve arrived! Like the Mysterious Press, the bookstore is very active in cyberspace. I recommend subscribing to its newsletter to keep up with the latest and best in crime fiction. A neat idea: The Mysterious Press prints long stories or novellas by distinguished writers in chap books, costing about $6 US. I picked up The Little Men by Megan Abbott, a truly chilling tale. Excellent writing: I can’t wait to dive into her novels! 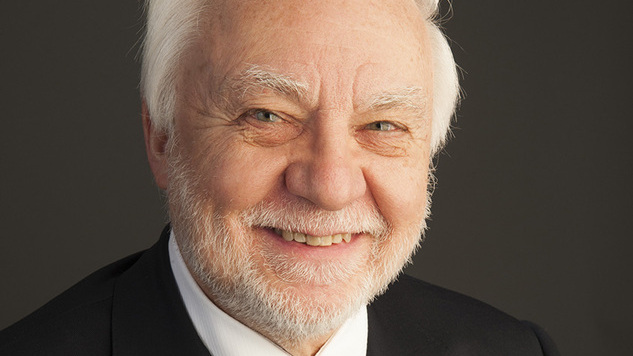 Otto Penzler is regarded as the world’s foremost authority on crime fiction. In 1975 he founded The Mysterious Press, publishing virtually all the greats: Raymond Chandler, Mickey Spillane, P.D. James, Ruth Rendall, Ellis Peters, the list is endless. He also worked closely with many of my personal favs: Sue Grafton, Michael Connelly, James Lee Burke. Over the years, The Mysterious Press underwent many changes, thanks to the constantly evolving – or perhaps devolving – publishing biz until Penzler got the name back. In 2011, he founded Mysterious Press.com, a digital publishing house for vintage crime writers like Ross Macdonald. Every year, Penzler brings out the highly regarded anthology, Best American Mystery Stories. 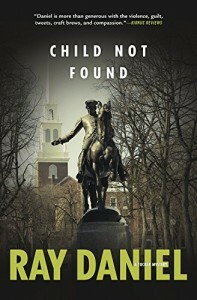 (Canadians are eligible as long as their stories are published in the USA.) To be inspired by the best in crime fiction writing, these stories can’t be beat. EAT ALL OF THESE ANTHOLOGIES!! 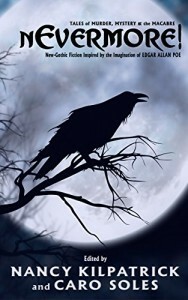 This year, the Robert Lopresti story in my friend, Caro Soles’ Poe tribute anthology, Nevermore, was accepted into Penzler’s anthology – a dream come true for any crime writer.